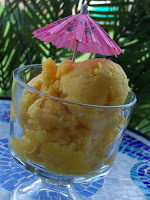 My husband and I really love Mangoes.We fell in love with them living in Brazil, along with other fresh tropical fruit that’s in abundance there, like pineapple, coconut, star fruit etc.So this fresh mango sorbet recipe from Williams-Sonoma was an instant hit in our house.In fact, since I started writing this post, my 2 year-old has devoured 3 bowls of it. With only a few ingredients you really taste each fabulous flavor.Plus to make things even easier, you don’t even have to make a simple syrup for this one, you just dump the sugar right in. 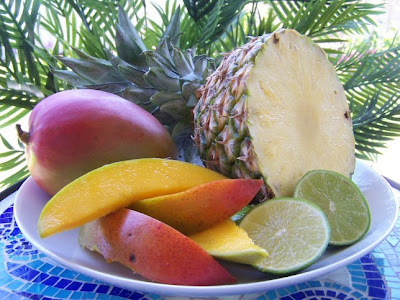 a few mangoes, a couple of limes, and a pineapple. You want to make sure you use mangoes that are ripe, or even a little over-ripe, because they’ll be extra soft and sweet. Perfect for dessert! Under-ripe mangoes will be a bit tart and you won’t get as good of a puree. 3-4 mangoes, peeled and diced. In a food processor (or good blender), puree themangoes until you have about 3 cups. Add the sugar and lime juice and process to combine. Transfer to a large bowl and stir in the pineapple. Yup. It’s that easy. Pour the mixture into an ice cream maker* and freeze let it go until it looks icy, yummy, and firm, about 30 minutes. Transfer to an airtight container and freeze until ready to serve.To serve the following day, set out on counter for about 15 minutes to soften. *If you don’t have an ice cream maker, just place in an airtight container and put it in the freezer. Take it out and stir once an hour for 3 hours, or until it’s too hard to stir. This recipe serves about 8 people, or 3 if you live with my husband . And if you’re wondering, the answer is yes. You can totally eat this for breakfast. This is the best sorbet, hands down, I’ve ever had. The flavor is incredible and after it melts just a little it’s perfect. So a grand thank you to Mr. William Sonoma, and to the one who brought it to the masses of this blog, meu amor. I also had to do the dairy free thing with my twins for 10 months and I fell in love with sorbet! We love mangos in this house so I can’t wait to try it. The only hard part is finding a decent mango around here! Heidi, I don’t know where you live, but around here I find the best mangoes at Sam’s Club of all places! Plus they come in a box of 6 for only 5 bucks. Can’t beat that. They’re always so sweet and yummy too. And thanks for the dairy condolences girls! lol. I LOVE mangoes, and can’t wait to try this! I think I’ll make it for dessert on Father’s Day. We love mangoes, too. Costco usually has good ones. After we slice them in half (removing the core, of course) we slice them horizontally and vertically while the fruit is still attached to the skin. Then, we flip the skin inside out. All the little squares of mango pop up and you can just eat it right off peel. I hope that made sense! My husband lived in Australia (with all the Polynesians) and that is how they ate them. Meagan, I know exactly what you’re talking about! I’ve done it that way too, works great. oh, this sounds amazing. I think I will have to make this. Yum!!!! yum yum yum! i’ve got my freezer bowl freezin’ away, can’t wait to try this tommorrow. i’ve been wanting to to a sorbet all week. . .
Great recipe! I’m going to have to dig out my ice cream machine. Do you and your hubby ever buy the dried mangos from Costco? Phillipine is the brand and they are delicioso!! Sam’s has a much smaller bag but you get more for your buck at Costco. The best part of them is the sugary substance they coat them in! Ymmy! OH MY GOSH. So sosososososo good. I literally ate the whole batch by myself over the last three days. I have to go to the store and get more stuff so I can make another batch and couble it so I don’t go through it so fast. lol. Can I just say this is my new favourite treat ever?? I know this post is almost 2 years old, so I don't know if this question will be noticed, but would it work if you froze the mango first? Then would you have "instant" sorbet instead of freezing afterward? Hi Stephanie- yes, we see all of the comments no matter how old! 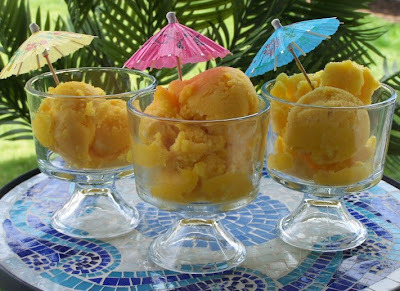 You could probably use frozen mango, but 1) it might damage your food processor and 2) you'd probably get more of a smoothie than a sorbet. If anything it might just require less freezing time in the end. Can’t wait to try this! Just stumbled upon your website from the House of Smith’s and now I am eager to purchase your cookbook! Many yummy recipes! Mangoes are not the same in the states. Period. I loved them in Brazil! We eat them as often as my mango-snobbery will allow. 😉 We went to Curitiba, where in Brazil were you?